I am always struggling to get more productive and to get more things done in less hour. 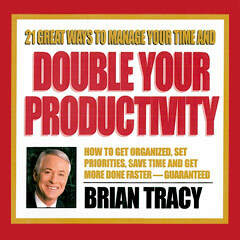 Right now I am trying Brian Tracy´s “21 Great Ways to Manage Your Time and Double Your Productivity”. i would also like to share the book with you. How many times have you exclaimed, “There just aren’t enough hours in a day? !” 21 Ways to Manage Your Time and Double Your Productivity by Bryan Tracy will show you prioritizing your tasks can make you 2 to 3 times more productive. 21 Ways to Manage Your Time and Double Your Productivity is the fast-track to your goals and dreams. In this program I give you 21 iron clad methods to speed through your “to do” list and still have time to relax with your family and friends. It’s easy to do once you start!